Welcome to the latest edition of Tribe’s weekly E-commerce and startup strategy round-up. If you’re looking for some content gems from the past week in the areas of E-commerce marketing, development, design, business growth, or general startup strategy, you’ve come to the right place! Subscribe to our blog if you’d like to get these sweet weekly round-up posts delivered directly to your inbox. You wouldn’t even have to put on pants and come all the way to our website to get this amazing content – how great is that? Which Social Media Networks are Right for Your Brand? By Nicole Kohler – Is your business active on Facebook? How about Twitter? LinkedIn? Pinterest? Instagram? Snapchat, Vine, and Meetkat? Yea, we know – it’s a lot to take in. Here’s the thing: instead of spreading yourself think across dozens of social media channels and blasting your message to a potentially irrelevant audience, wouldn’t it be nice to know which networks your brand should focus on? Lucky for you, Nicole Kohler’s post on the WooThemes blog has you covered! Nicole breaks down the ideal uses and targeted audiences of the major social networks, allowing you to determine which social media networks have the most potential for your E-commerce brand. By Tucker Schreiber – As a small startup ourselves, we’re always looking for ways to make our daily tasks and processes easier. Whenever we come across an awesome tool that increases performance or boosts productivity, we love sharing that with the world. Then Tucker Schreiber had to come along and show us up by sharing 57 tools and apps for entrepreneurs, all in this awesome post! Well played, Tucker. Well played. 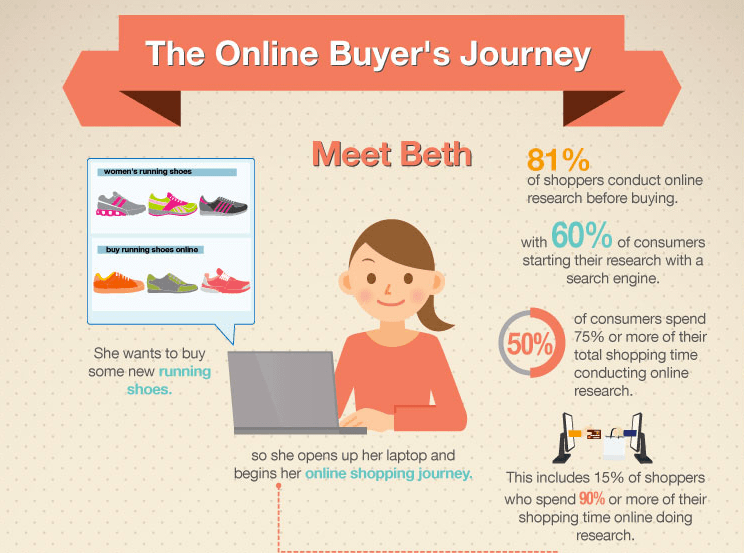 By Zac Heisey – This week we published an infographic that followed Beth, our fictional online shopper, as she made her way through the online buying journey. At each step in her journey, we provided some key statistics that can help when crafting your E-commerce marketing or web design strategy. By Alfred Lua – This post from Alfred over at Despreneur was near and dear to our hearts. We’re a fully distributed team here, so we’re all over any post about overcoming remote working obstacles or growing our knowledge of remote working. Alfred does an amazing job of detailing his remote working day, and even includes a robust list of tools he uses to communicate, minimize distractions, and work as efficiently as possible. Bravo, Alfred!